best way to get the best price in the shortest time. 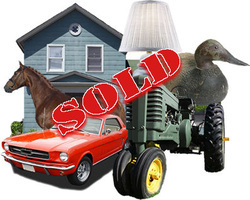 Real Estate, farm equipment and personal property can all be sold at auction. Auctions create Action and Quick Results. The Auction method has stood the test of time - no matter what you're selling: real estate; business liquidation; farm; estate; or personal property. Doug has spent over 20 years in real estate, is a licensed real estate broker and has over 25 years of auctioneer experience with all types of auctions. We can provide you with everything you need to make your auction a success and offer a FREE ONSITE EVALUATION of your property. We can give you a more personalized auction with a more controlled atmosphere onsite or internet-based. Reach out to Doug directly via phone at (320) 630-6651 or email dougm@scicable.com anytime! After viewing the items you want to sell, we perform a cost analysis, discuss rates, terms and set a date. Marketing comes next with an individually designed poster, pictures gathered and all published here - with your own site page! Looks like another great year for auctions - The only way to sell - Auctions create action. The auction method of selling has stood the test of time whether using the traditional onsite live or online only or live and online. When considering selling anything, an auction is the way to go. Some of the big changes we have seen in the last year have been the tax laws and what gets taxed and what doesn't. Another change is what should be sold live auction or what should be sold online only or using both methods at one time. As a seller, it is imperative to understand the pros and cons of both methods. As a buyer it’s important to understand that 90% of online auctions have very specific ground rules and expenses as a buyer - buyer’s premium being the biggest one and shipping. Understanding the importance of knowing what you are buying prior to bidding. As a seasoned auctioneer, I highly recommend to sellers and buyers the importance of having a viewing of items on any auction so that everyone is aware of what they are buying and the expenses that a buyer may incur during the transaction. Methods of marketing are in a constant change as well. How much do we print of paper media? Should we run a radio or TV ad? What is our online presences like? What is a fair balance to get the word out? Commission is an important aspect and can be a negotiable item. When considering an auction company, consider what added-value services are provided. This may include experience, reputation, knowledge of the items being sold, properly licensed and bonded, and marketing capabilities. Each of these items are important and often times justify the commission expense. Having a positive reputation with previous sellers and buyers and being a member the state association also bring value. Hiring an auctioneer is very similar to hiring a plumber, electrician, or a carpenter - each need to understand what they are working with to create a plan of success. Selling real estate at auction is a great first option if the property is unique or has never been exposed to the current market. Selling real estate at auction provides great exposure, maximizing time on the market. This process can sometimes supersedes what a traditional market can get, achieving top dollar with multiple potential buyers. Another great advantage is that the seller sets the terms upfront and negotiations complete within 24 hours or less, no waiting! And after viewing the merchandise, we will establish costs incurred and services offered. Contact Us for a FREE, No Obligation Quote of Services! Please provide a phone number where you can be reached. Please enter an email address where we may send you more information. Feel free to provide us with any information you can provide. All items are sold "as is", no warranties implied or expressed. All items need to be settled for before leaving premises. Once an item is sold, it is the buyers sole responsibility to settle for an item and remove in a timely fashion. Seller and auction company are not responsible for theft or damage of any item after it is sold. All sales are final. Credit cards accepted with proper ID of buyer/card owner with a 5% processing fee on all credit card purchase. Auction terms are subject to change.